Antonio Thomas and Julieaunna Clark love their high school and don't want it to close. 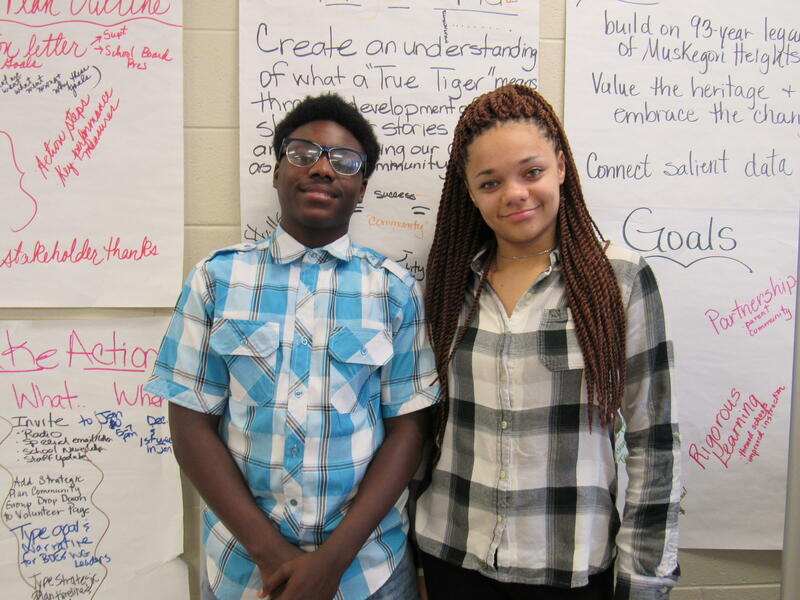 For this week’s State of Opportunity, Julieaunna Clark and Antonio Thomas, two high school students from Muskegon Heights, interview each other about the fate of their school. What follows is an edited transcript of their conversation. We’ll start with Julieaunna and the now infamous letter the state sent to their school back in January. JULIEAUNNA CLARK: Ok, I will start with a question for Antonio. How did your parents react to the situation of what’s going on with the school and everything? ANTONIO THOMAS: My dad first got the letter. It was more of 'is this real or is this something that is just coming to us just to scare people away from the school?' 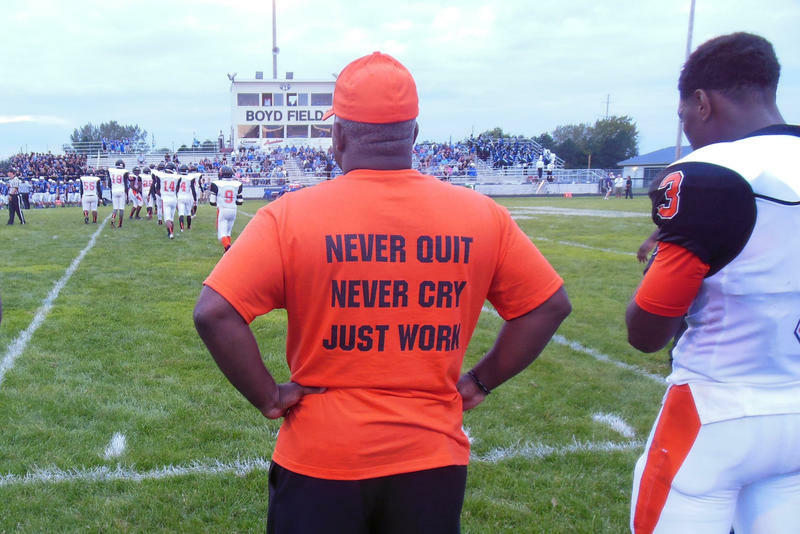 Because my dad knows, he would hate for a school like this to shut down because most kids wouldn’t have the opportunities that we have now because of the fact: where would they be, what school would they kind of transition to and still get that home feeling that they have here at Muskegon Heights? ...I swear this school is the most talented school here. I mean, test scores may not show it, but if you walk up in here, you will have a friend the moment you walk through those doors. JC: This school is probably one of the most family-oriented schools anywhere around in Michigan. I swear this school is the most talented school here. I mean test scores may not show it, but if you walk up in here, you will have a friend the moment you walk through those doors. You will have someone ‘I’ve got your back if you do something wrong. I’m a pick you up but I’mma tell you right from wrong.’ You have someone like that in the school, and I don’t feel like I can get that from anywhere else. AT: Well, my question for you is: what do you think about when people say Muskegon Heights is a failing school? JC: We are not a failing school. We have talented, intelligent people that wander these halls. And I just wish that one day people would just walk through these halls and see how magnificent these kids are because we have [future] doctors, future lawyers, we have it all here, just like any other school has. I mean, we may have under-performed in tests a couple times, but right now we have kids who actually have life behind them, who have struggles. And I see us as a high-performing school to have to handle stuff at such a young age. We are kids who have to handle a struggle and maintain and handle our business at the same time. So, yeah. ...we have kids who actually have life behind them, who have struggles, and I see us as a high performing school to have to handle stuff at such a young age. AT: Well, my last question is how: how confident are you in our school? And how confident are you that it’s gonna be still standing? JC: I’m very confident ‘cause we’ve had our school about ready to close four or five times, and this...this school ain’t closing. They really gonna have to knock down these doors to close this school because you know we gonna have students sitting there waiting, be like, this school ain't going nowhere. It’s just hard to take the heart of the community away. It’s like telling somebody to stop breathing air. And I’m beyond confident because you’re not taking the air away from me. You're not taking away my paradise, my place where I’m comfortable. This school has to stay open. It’s got to stay open. AT: Well, you’re right on that. This school is like a tradition. You keep it here, you keep it running, oiled because at the end of the day there’s still great things in the building. You just have to come for yourself and look. There are a lot of school districts in trouble in Michigan. Forty-five districts are in a deficit. Five districts are currently subject to state oversight under Michigan's emergency manager law. Two school districts completely ran out of money last year, and dissolved. Today, in a State of Opportunity documentary, we bring you the story of how one troubled school district survived. Two years ago Muskegon Heights made history by becoming the first school district in Michigan to convert entirely to a charter district and turn the operation of its schools over to a for-profit company. It had never happened before in Michigan, or, as far as we've been able to determine, anywhere else in America. 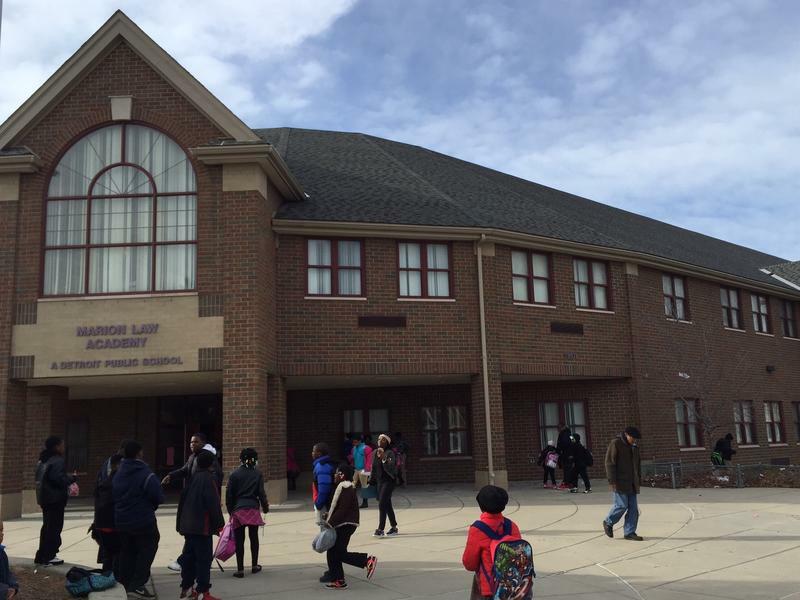 But this spring, Muskegon Heights schools were in trouble again. Just two years into a five-year contract, its management company walked away from the district. And, once again, leaders in the community had to work with the state to find a plan to keep the district's doors open. This, ultimately, is the story of how they succeeded, at least for now. And what lessons we might take for the other school districts in Michigan that are facing financial problems. Is Muskegon Heights too violent to host a high school football game? It’s a serious question some school officials in Saginaw, Ann Arbor and neighboring Muskegon have asked themselves in the last couple of weeks. The answer, for some, has been a reluctant – yes. Muskegon Heights’ football team hasn’t played a game at home this season.